The DARDA system incorporates construction, creativity, action and fun. Powered by the precision engineered Mega Motor, speeds of 500-600 scale mph can be achieved with just one small wind - no batteries, keys, or electricity needed! The more complex track layout of Upside Down Overpass means more loops, more thrills and even more possibilities! Power up you car to go totally upside down five times in a row. Watch the car speed through an awesome five-loop corkscrew or create your own gravity-defying layout. Set includes illustrated instructions for 3 layouts. 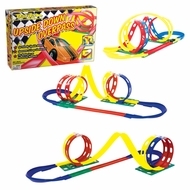 Set includes: 2 Molded Curve 2 Base Plates 3 straight track 8 bendable track to complete 4 loops.